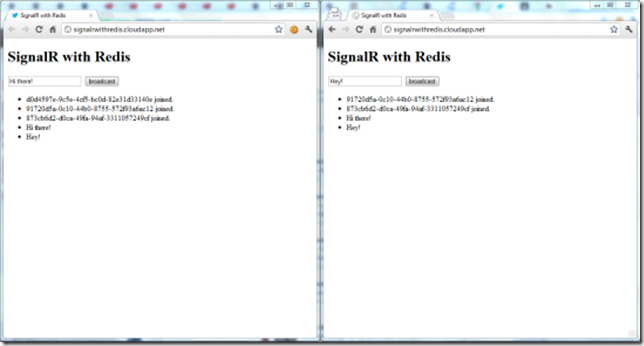 Long time ago (about 5 years, at least), I contributed an article to SignalR wiki about scaling SignalR with Redis. You can still find the article here. I also blogged about it here. However, over time, pictures got lost there. I got a few requests from my readers to refresh those images and I was luckily able to find them :) I decided to publish that article here so that I would have a much better control over the content. Please keep in mind that this is a really old post and lots of things have evolved since then. However, I do believe the concepts still resonate and it’s valuable to show the ways of how to achieve this within a cloud provider’s context. 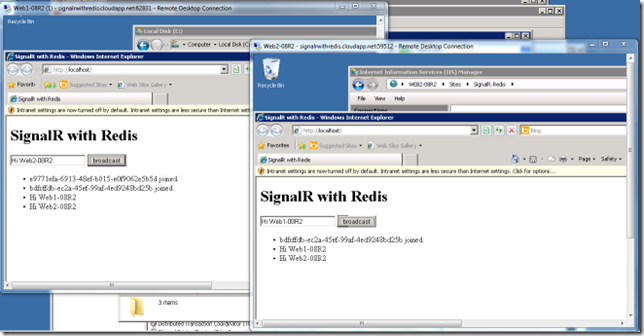 This wiki article will walk your through on how you can run your SignalR application in multiple machines with Redis as your backplane using Windows Azure Virtual Machines for scale out scenarios. First of all, we will spin up our virtual machines. What we want here is to have two Windows Server 2008 R2 virtual machines for our SignalR application and we will name them as Web1-08R2 and Web2-08R2. We will have the IIS installed on both of these servers and at the end, we will load balance the request on port 80. Our third virtual machine will be another Windows Server 2008 R2 only for our Redis server. We will call this server Redis-08R2. To spin up the VMs, go to new Windows Azure Management Portal and hit New icon at the bottom-right corner. 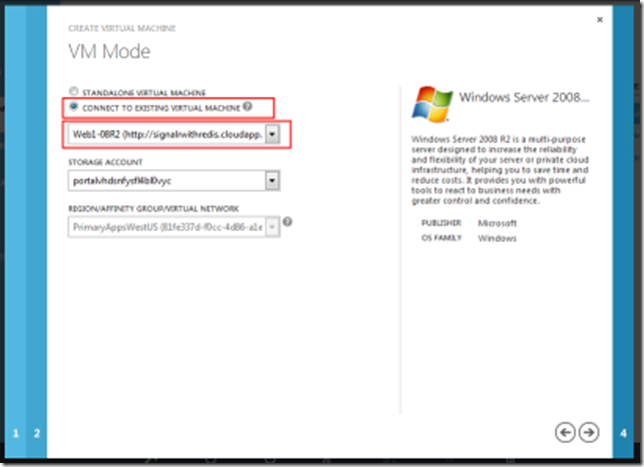 Creating a virtual machine running Windows Server 2008 R2 is explained here in details. We followed the same steps to create our first VM named Web1-08R2. The second VM we will be creating has a slightly different approach than the first one. Under the hood, every virtual machine is a cloud service instance and we want to put our second VM (Web2-08R2) under the same cloud service that our first web VM is running under. 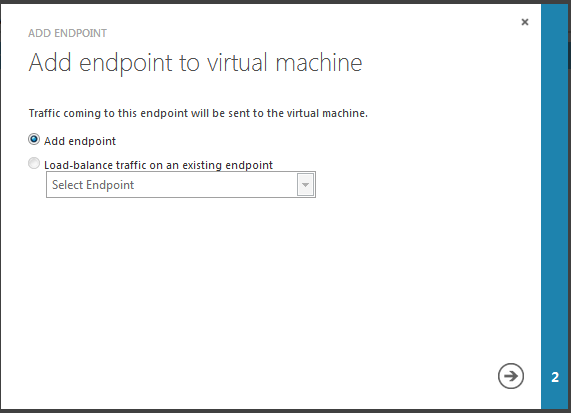 To do that, we need to follow the same steps as explained inside the previously mentioned article but when we come to 3rd step in the creation wizard, we should chose Connect to existing Virtual Machine option this time and we should choose our first VM we have just created. As the last step, we now need to create our redis VM which will be named Redis-08R2. We will follow the same steps as we did when we were creating our second web VM (Web2-08R2). To use Redis on a Windows machine, we went to Redis on Windows prototype GitHub page and cloned the repository and followed the steps explained under How to build Redis using Visual Studio section. Currently, there is a bug in the RedisWatcher installer and if you don't have Microsoft Visual C++ 2010 Redistributable Package installed on your machine, the service won't start. So, I installed it first. Then, extract the rediswatcherbin.zip somewhere and run the InstallWatcher.msito install the service. Create a folder named inst1 under c:\redis because we have specified this folder as working directory for our redis instance. When you do a search against windows services in PowerShell, you will see RedisWatcherSvc service is installed. Run the following PowerShell command to start the service for the first time. Now, you have a redis client running. Now, we are nearly set. As a last step in our redis server, we need to open up TCP port 6379 for external communication. You can do this under Windows Firewall with Advanced Security window as explained here. When you are inside one of your web VMs, you can simply look up the redis VM by hostname. 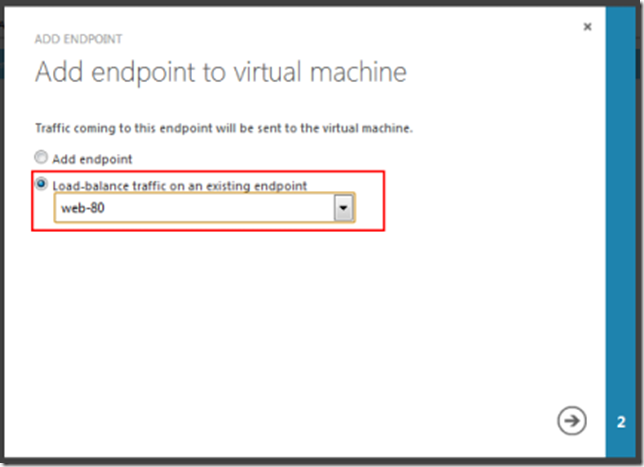 The hostname will resolve to DIP (Dynamic IP Address) which Windows Azure will use internally. 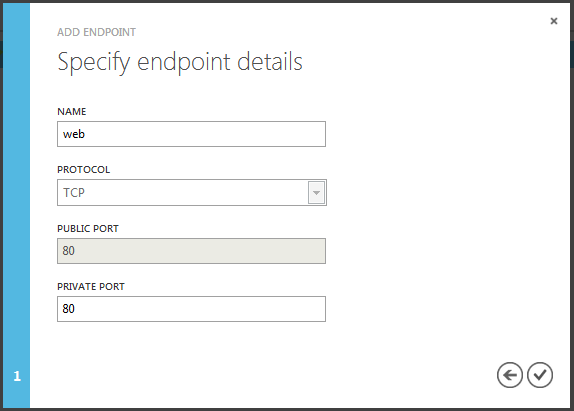 We can configure public endpoints through Windows Azure Management Portal easily but in that case, we would be opening redis to the whole world. Also, if we communicate to our redis server through VIP (Virtual IP Address), we would always go through the load balancer which has its own additional cost. So, we can easily connect to our redis server from any other connected VM by hostname. I put the application under IIS on our both web servers (Web1-08R2 and Web2-08R2) and configured them to run under .NET Framework 4.0 integrated application pool. 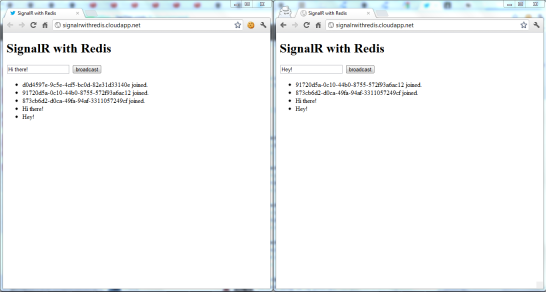 For this demo, I am using the Redis.Sample chat application included inside the SignalR.Redis project. Perfectly running! Let's open them up to the world. Our requirement here is to make our application reachable over HTTP and at the same time, we want to load balance the request between our two web servers. 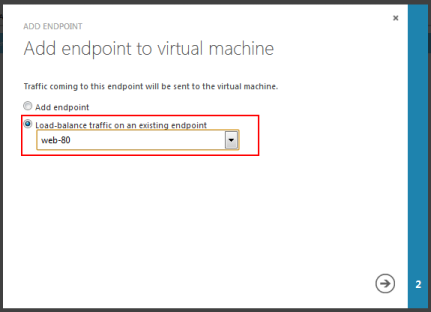 To do that, we need to go to Windows Azure Management portal and set up the TCP endpoints for port 80. We will see our new endpoint is being crated but this time Load Balanced column indicates Yes. No matter which server it goes, the message will be broadcasted to every client because we will be using Redis as a message bus. I was at Microsoft Turkey office yesterday and I gave a presentation on ASP.NET Web API and SignalR in context of this year’s MSP Kickoff. This post covers where you can reach out to presentation slides, recording and several relevant links. I was at Microsoft Turkey office yesterday and I gave a presentation on ASP.NET Web API and SignalR in context of this year’s MSP Kickoff. 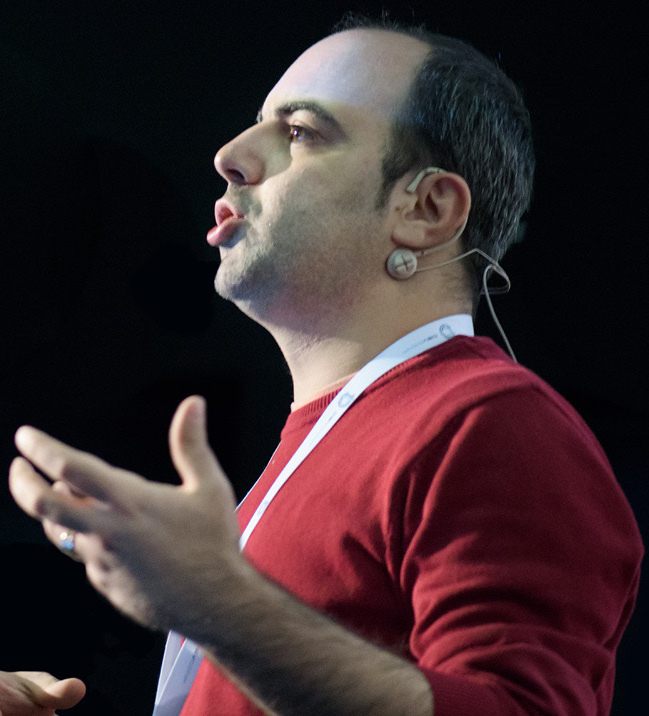 You can find the slides of the talk on Speakerdeck. ASP.NET Web API and SignalR from Tugberk Ugurlu on Vimeo. As of today, I am starting a new blog post series about ASP.NET vNext. To kick things off, I would like to lay out the resources about ASP.NET vNext here which is probably going to be an ultimate guide on ASP.NET vNext. Web development experience with .NET has never seen a drastic change like this since its birth day. Yes, I’m talking about ASP.NET vNext :) I have been putting my toes into this water for a while now and as of today, I am starting a new blog post series about ASP.NET vNext (with hopes that I will continue this time :)). To be more specific, I’m planning on writing about the things I am actually excited about this new cloud optimized (TM) runtime. Those things could be anything which will come from ASP.NET GitHub account: things I like about the development process, Visual Studio tooling experience for ASP.NET vNext, bowels of this new runtime, tiny little things about the frameworks like MVC, Identity, Entity Framework. Getting Started with ASP.NET vNext and Visual Studio "14"
POCO controllers in ASP.NET vNext by Filip W.
KRuntime: The core of the ASP.NET vNext. Compilation, bootstraping, package discovery and all other core stuff is handled here. Do not miss on this one! kvm: K Runtime version manager which works on Windows and Unix based systems. MVC: Written from scratch MVC framework on top of ASP.NET vNext. This new framework unifies the efforts on ASP.NET MVC and ASP.NET Web API. So, all is in one now. HttpAbstractions: Contains HTTP abstractions for ASP.NET vNext such as HttpRequest, HttpResponse. Also contains IApplicationBuilder and types to create your application's hosting pipeline. Home: ASP.NET vNext Home repository where you can get a head start on ASP.NET vNext really quickly. Its README file gives you a nice guide to get your machine up and running with the new tools. It also contains tiny samples which you can run and see how things are working in no time. KestrelHttpServer: This repo contains a development web server for ASP.NET vNext based on libuv. Configuration: Configuration is a framework for accessing Key/Value based configuration settings in an application. Caching: Contains libraries for caching for ASP.NET vNext. Another sign that everything is now composable. Options: Options is a framework for accessing and configuring POCO settings. Tiny thing that makes me happy that even this thing is thought of. SignalR-Server: ASP.NET SignalR is a is a new library for ASP.NET developers that makes it incredibly simple to add real-time web functionality to your applications. This repository exposes ASP.NET SignalR on top of ASP.NET vNext. 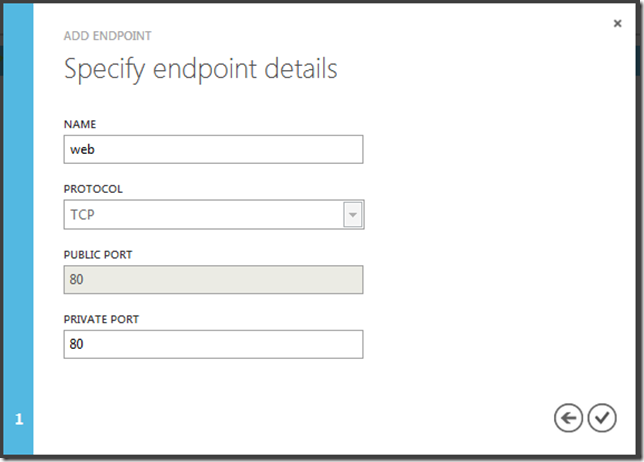 Hosting: The Hosting repo contains code required to host an ASP.NET vNext application, it is the entry point used when self-hosting an application. INTRODUCING: The Future of .NET on the Server: Very first video on ASP.NET vNext. Join the Lesser Scotts, Hunter and Hanselman, as they introduce you to new thinking around ASP.NET and the .NET Framework. What does ASP.NET look like in 2014 and beyond? In a world of NuGets and modular frameworks, of lightweight VMs, how could ASP.NET change and get faster, leaner, meaner, and more. DEEP DIVE: The Future of .NET on the Server: Scott Hanselman joins developer David Fowler for this Part 2 Deep Dive into what’s coming in Microsoft ASP.NET. We explore what a decoupled stack looks like, how modules plug together, what this means for performance, and more. We explore the Project codenamed “Helios” and how this new way of writing ASP.NET applications uses OWIN and plugs into IIS giving you more power and choice than ever before. Channel 9 Live: ASP.NET Developer Q&A with Scott Hunter & Scott Hanselman: The Scotts and David Fowler answer your questions live! The Future of ASP.NET Part I: Scott Hanselman’s awesome intro talk on ASP.NET vNext at NDC Oslo 2014 conference. The Future of ASP.NET Part II: David Fowler and Damian Edwards Q&A session on ASP.NET vNext at NDC Oslo 2014 conference. An Introduction to ASP.NET vNext: Awesome introduction talk by Daniel Roth at TechEd New Zealand 2014. ASP.NET vNext 101: Another great introduction talk on ASP.NET vNext by Damian Edwards and David Fowler at dotnetConf 2014. ASP.NET MVC 6 (now with integrated Web API! ): Awesome introduction at dotnetConf 2014 by Daniel Roth on ASP.NET MVC 6 which is a new baby from head to toe. ASP.NET MVC and Web API are being combined into a single framework, ASP.NET MVC 6, for handling all of your Web UI and services. We'll learn how to use ASP.NET MVC and Web APIs in ASP.NET vNext to support connected applications for browsers, Windows Phone, Windows Store and more! Entity Framework: Rowan Miller gives us an introduction talk at dotnetConf 2014 about Entity Framework 7 which is built on this new .NET Runtime optimized for server. Entity Framework is Microsoft's recommended data access technology for new applications in .NET. We'll explore how the current release of Entity Framework can be used to build applications. We'll also look at an early preview of EF7, a modern, lighter weight, and composable version of Entity Framework (EF) that can be used on a variety of platforms, including ASP.NET vNext, Windows Phone and Windows Store. This new version will also support targeting non-relational data stores. ASP.NET vNext with Chris Ross: On Web Camps TV, this week Cory is joined by Chris Ross from the ASP.NET team to talk about the vNext bits of ASP.NET. The next version of ASP.NET ("ASP.NET vNext") has been redesigned from the ground up. The goal is to create a lean and composable .NET stack for building modern cloud-based apps. ASP.NET vNext Community Standup: Meeting recordings from the weekly ASP.NET vNext Community Standup meetings, covering live community Q&A, product team discussion and the most recent updates. ASP.NET vNext - Everything you need to know in 4 minutes! : Nice intro on new ASP.NET vNext in a short, 4 minutes video. This nicely wraps up what are the new things. ASP.NET vNext Giriş (in Turkish): 30 minutes webcast on ASP.NET vNext by Tugberk Ugurlu in Turkish. The Future of Microsoft .NET on the Server: Scott Hunter’s TechEd session on ASP.NET vNext at TechEd Europe 2014. Reconciling ASP.NET vNext with Damian Edwards: Hanselman sits down with Damian Edwards and talks about ASP.NET vNext. There's been a lot of talk around ASP.NET vNext. How did development start, and what's been the thinking about how to manage a new world while still innovating on the current generation of technology? In what ways does ASP.NET vNext break from the past, and in what ways does it build on our existing power and experience? ASP.NET vNext with Jeff Fritz: Carl and Richard chat with Jeff Fritz about ASP.NET vNext at DotNetRocks. Evolving ASP.NET Web Development with Scott Hunter: Carl and Richard chat with Scott Hunter about how Microsoft is working to evolve web development for ASP.NET developers. Scott talks about ASP.NET vNext as well. Herding Code 198: Damian Edwards on ASP.NET vNext, Tag Helpers and SignalR: The guys talk to ASP.NET team member Damian Edwards about ASP.NET vNext (the next version of ASP.NET), Tag Helpers, and what’s new with SignalR. MusicStore: Best sample out there for ASP.NET vNext by the team. It has two projects: one is for static-rendered Music Store application and the other one is a SPA (Single Page Application). Check out this article for further information about the sample. BugTracker: Another sample application from ASP.NET team. This one is also uses SignalR. Check out the this article for further information about this sample. MVC Samples: Lots of tiny MVC samples that ASP.NET team is using for functional tests. Entropy: ASP.NET vNext feature experience playground of ASP.NET team. MvcSample.Web: ASP.NET MVC 6 sample which highlights quite a lot of its features. vNextLanguageSupport: A sample by David Fowler that has examples of how to support different languages in the vNext project system. AspNetVNextSamples: My repository on ASP.NET vNext samples. It’s sort of tiny right now but I’m putting this here anyway hoping that it will get big in near future. In context of Microsoft Turkey Summer School 2014, I had a chance to give a talk on ASP.NET Web API and ASP.NET SignalR a few days ago at Microsoft Turkey Office. Here is the slides, recording video and references from the talk. In context of Microsoft Turkey Summer School 2014, I had a chance to give a talk on ASP.NET Web API and ASP.NET SignalR a few days ago at Microsoft Turkey Office. You can find the slides of the talk on Speakerdeck. The talk was in Turkish and it has been recorded. A while back, ASP.NET team has introduced ASP.NET Identity, a membership system for ASP.NET applications. 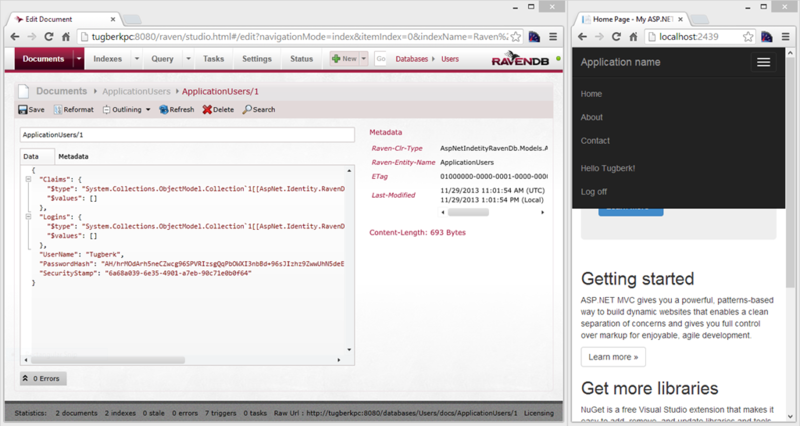 Today, I'm introducing you its RavenDB implementation: AspNet.Identity.RavenDB. A while back, ASP.NET team has introduced ASP.NET Identity, a membership system for ASP.NET applications. 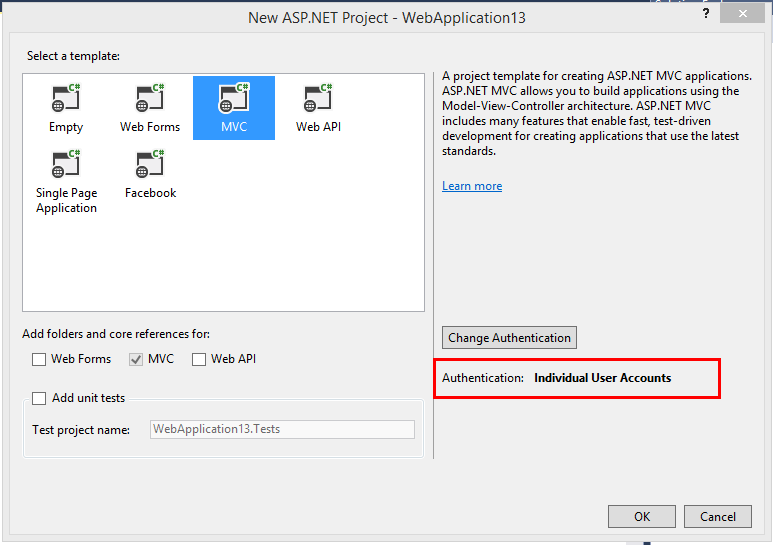 If you have Visual Studio 2013 installed on you box, you will see ASP.NET Identity Core and ASP.NET Identity Entity Framework libraries are pulled down when you create a new Web Application by configuring the authentication as "Individual User Accounts". After creating your MVC project, you will see that you have an AccountController which a completely different code from the previous project templates as it uses ASP.NET Identity. You can find tons of information about this new membership system from ASP.NET Identity section on official ASP.NET web site. Also, Pranav Rastogi (a.k.a @rustd) has a great introduction video on ASP.NET Identity which you shouldn't miss for sure. Getting started with AspNet.Identity.RavenDB is also really easy. 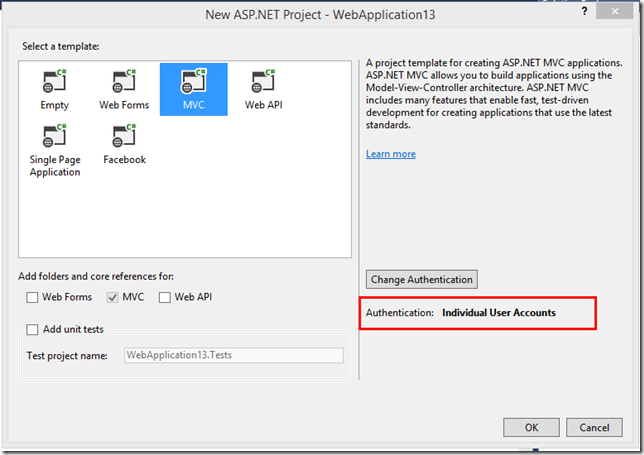 Just create an ASP.NET MVC application from scratch by configuring the authentication as "Individual User Accounts". Then, install the AspNet.Identity.RavenDB package. As the default project is set to work with ASP.NET Identity Entity Framework implementation, you need to make a few more tweak here and there to make it work with RavenDB. Before starting up my application, I expose my RavenDB engine through http://localhost:8080. and I'm all set to fly right now. 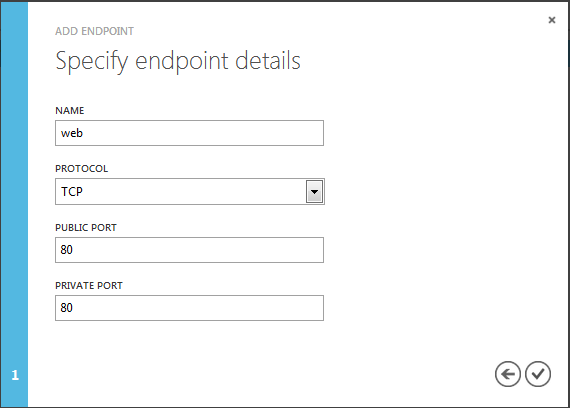 The default project template allows me to register and log in the application and we can perform all those actions now. The same sample application available inside the repository as well if you are interested in: AspNet.Identity.RavenDB.Sample.Mvc. The current ASP.NET Identity system doesn't provide that many features which we require in real world applications such as account confirmation, password reset but it provides us a really great infrastructure and the UserManager<TUser> class saves us from writing bunch of code. I'm sure we will see all other implementations of ASP.NET Identity such as MongoDB, Windows Azure Table Storage, etc. from the community.